"Bortle" redirects here. For the asteroid, see 4673 Bortle. The Bortle scale is a nine-level numeric scale that measures the night sky's brightness of a particular location. It quantifies the astronomical observability of celestial objects and the interference caused by light pollution. 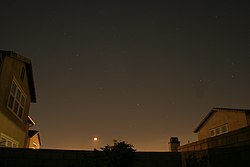 John E. Bortle created the scale and published it in the February 2001 edition of Sky & Telescope magazine to help amateur astronomers evaluate the darkness of an observing site, and secondarily, to compare the darkness of observing sites. The scale ranges from Class 1, the darkest skies available on Earth, through Class 9, inner-city skies. It gives several criteria for each level beyond naked-eye limiting magnitude (NELM). The accuracy and utility of the scale have been questioned in recent research. The table below summarizes Bortle's descriptions of the classes. ^ Bortle, John E. (February 2001). "The Bortle Dark-Sky Scale". Sky & Telescope. Sky Publishing Corporation. Retrieved 2013-02-20. ^ Crumey, Andrew (2014). "Human Contrast Threshold and Astronomical Visibility". Monthly Notices of the Royal Astronomical Society. 442 (3): 2600–2619. arXiv:1405.4209. Bibcode:2014MNRAS.442.2600C. doi:10.1093/mnras/stu992. Archived from the original on 2016-03-05.